As I’ve said a million times, October is my favorite month. I owe part of that to Starbucks. I’m not that big into coffee, instead I’m much more of a tea type of gal. 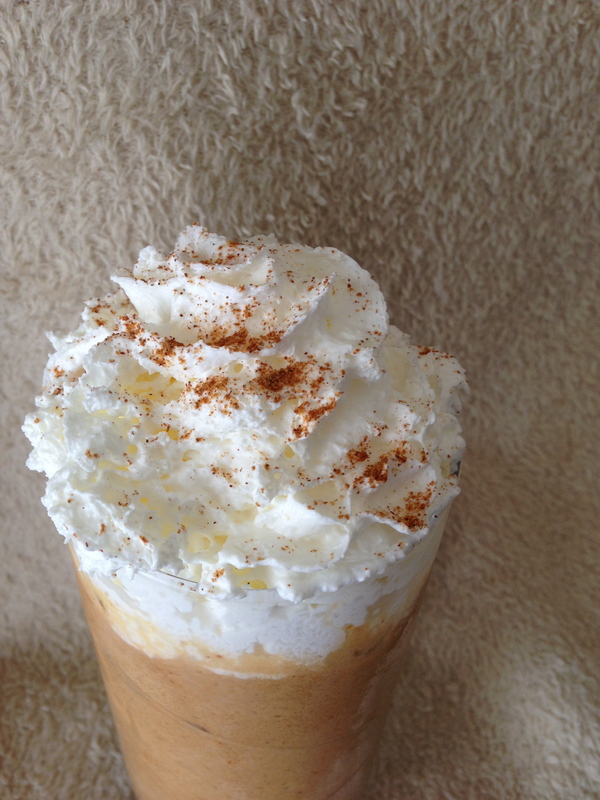 But I do treat myself to the occasional frappuccino when I’m feeling wild, or in October a pumpkin spiced latte. However, I recently walked into my Starbucks and asked if they could make me a pumpkin frappuccino. To my delight it was possible and was just as tasty as I had dreamed. I was hooked. I wanted them every day. But the steep price of Starbucks just isn’t practical. So I decided to make my own, and they came out delicious! You’ll see this recipe is a little different in that I actually freeze the mixture first and then blend it. The reason is, I tried to make the coffee mixture first but when I blended it with the ice, I just didn’t get the consistency that I wanted and it tasted a little watered down. However, if anyone finds a good recipe that think will work, that doesn’t include pumpkin syrup (that just doesn’t seem natural when you can use actual pumpkin!! ), please send it my way! 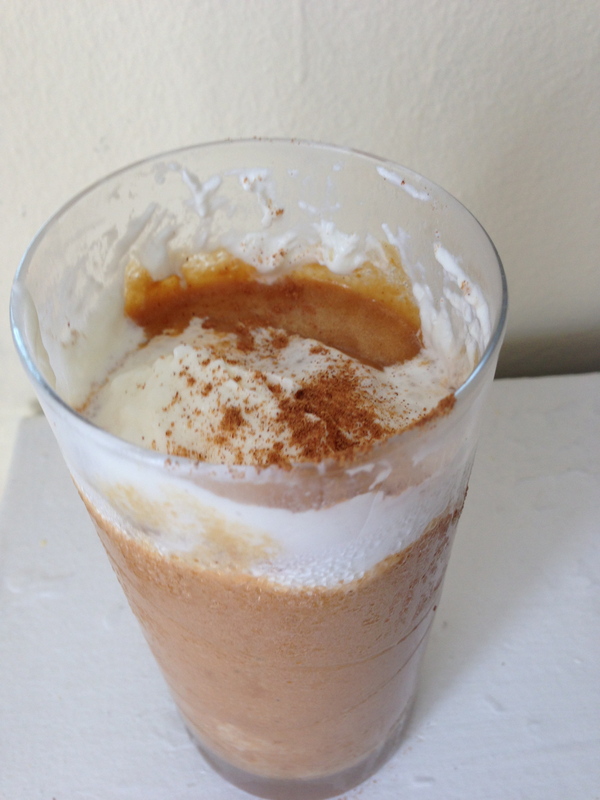 ** if you don’t have pumpkin spice, it’s simply a mixture of cinnamon, nutmeg and ginger. So I would do a pinch of each if you want to substitute for buying pumpkin spice. Or if all you have is cinnamon, just do a ¼ teaspoon of cinnamon. (1) Mix all the ingredients together in a medium bowl. Divide into 1 or 2 shallow plastic containers. The recipe as a whole would equal a venti/large frappuccino at Starbucks, but can easily be divided to spread out for two days. Freeze overnight (you probably only need a few hours, but I did it overnight, so in the morning I could take my drink to work with me). (2) Once frozen, thaw until just soft enough for your blender to be able to handle it (probably about 15 minutes), then blend until your desired texture is reached. I found that with my food processor (I don’t actually own a blender, shhhhh) it only took a minute or so. 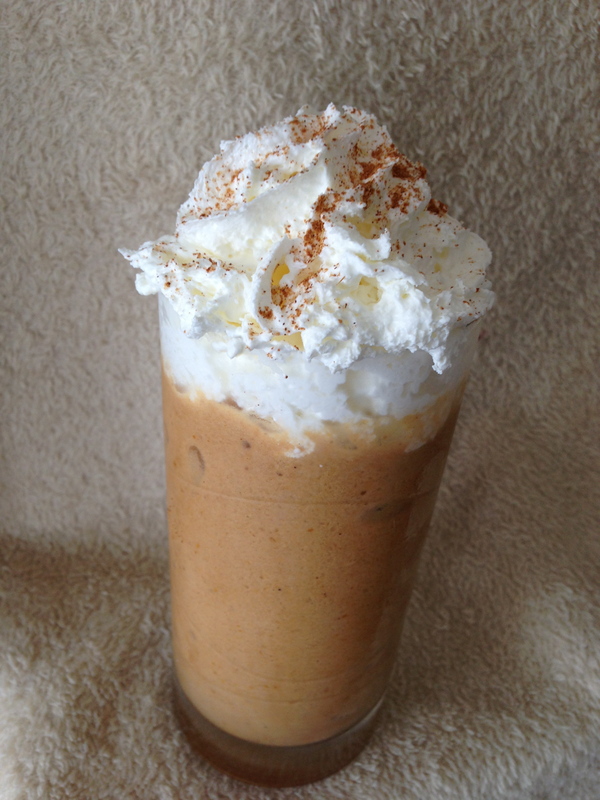 (3) Top with some whip cream and pumpkin spice or cinnamon.